The summer season has come and gone for Oregon Bach Festival, but not without presenting another year of critically acclaimed work and receiving international attention. The festival, which started in the early 1970s at the UO School of Music as a modest concert of short choral works, offered more than 50 concerts, lectures and free community events in 2016. These opportunities included the Bach masterpiece, “Mass in B Minor,” the virtuosic bluegrass band Punch Brothers and three performances from the Berwick Academy for Historically Informed Performance —­ the only training program of its kind in the U.S. The festival also featured high-profile artists such as Paul Jacobs (organ), Nicole Cabell (soprano), Robert Levin (fortepiano), Jeffrey Kahane (piano) and Rachel Podger (violin). 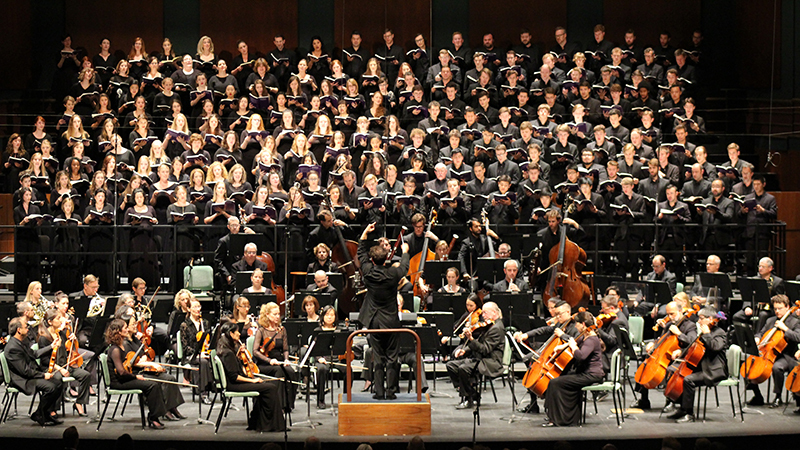 The 2016 festival closed with the popular Brahms’ “Requiem.” The commanding piece featured 235 artists, drew more than 2,100 audience members and became the highest-grossing festival concert since Matthew Halls became artistic director in 2014. Other season highlights included the world premiere of a new requiem from Scottish composer Sir James MacMillan (http://classicalvoiceamerica.org/2016/07/12/requiem-in-time-of-brexit-ex-post-facto-prescience/), a solo performance from tenor Nicholas Phan (http://registerguard.com/rg/entertainment/arts/34367155-60/review-phan-is-phantastical-in-bach-festival-concert.html.csp), and the Stangeland Family Youth Choral Academy (http://registerguard.com/rg/entertainment/arts/34367185-60/mature-pleasing-presentation-from-stangeland-youth-choir-at-bach-festival.html.csp).